Our modern view of the world is so conditioned by the road network that we often overlook routes used by our ancestors for centuries, simply because we can't drive along them. 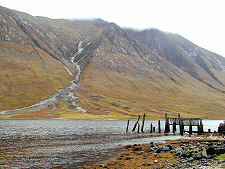 Loch Etive is an excellent example of a long-used through route that is now largely invisible simply because for most of its length it has no road. Loch Etive meets the Firth of Lorn and the open sea at Connel. 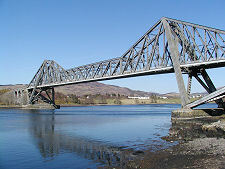 From here it stretches east past Ardchattan Priory and Ardchattan Priory Garden on the north shore and Taynuilt on the south, before dog-legging north east, ending after a journey of 17 miles from the sea at a ruined pier. Its northern end and the pier are accessible by car via a 14 mile drive down scenic Glen Etive along a minor road that starts at the head of Glen Coe. 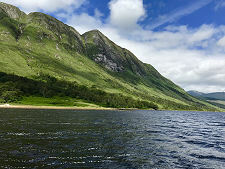 So while many people visit the southern end of Loch Etive, and some drive down Glen Etive to visit its northern end, much of the loch itself is seen by very few. It's not always been that way. 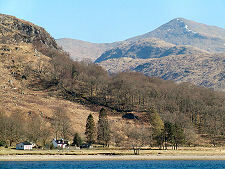 In 1750 there was a track running down the south side of the loch as far as Taynuilt. 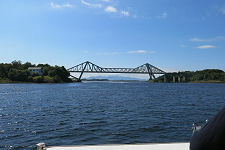 This was used as a major route across the highlands. 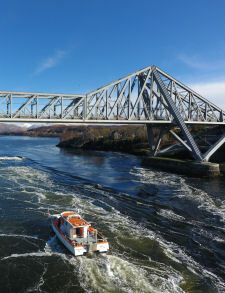 And from 1847 a steamer service from Oban carried passengers to the now derelict pier at the north end of the loch, linking to a carriage service that took tourists up Glen Etive to see Glen Coe. 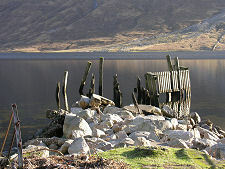 Loch Etive is one of the most attractive lochs in Scotland. 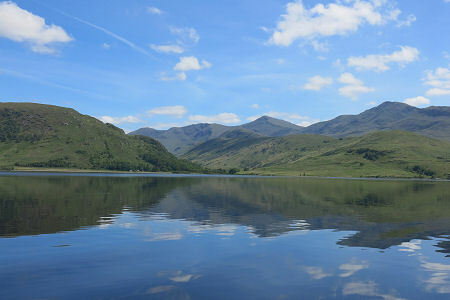 It is surrounded by wild countryside climbing to some very distinctive mountains towering over the loch. 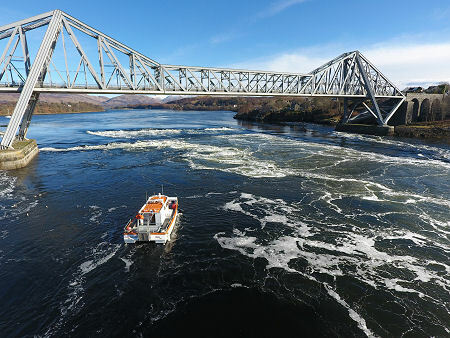 Those wanting to see these middle stretches of the loch have two choices. There are good tracks up both sides of the loch that serve the few houses and crofts on the lochside, and provide excellent footpaths. 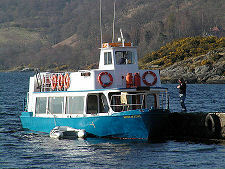 The really adventurous could plan an extremely long round trip taking in both sides of the loch for the full experience. 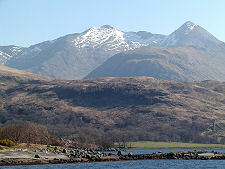 Collectors of mountains will have difficulty taking their eyes off the mountain landscape that surrounds the loch. 1,126m high Ben Cruachan to the east overlooks Taynuilt, but as you move north you begin to see its more rugged northern face. Beyond Glen Kinglass this eastern side of the loch is dominated by Ben Starav, reaching a height of 1,078m. But more impressive by far is Beinn Trilleachan. Overshadowing the west side of upper Loch Etive, this is a "mere" 839m in height. But it sweeps up from the edge of the loch so dramatically it looks far taller. And the impression of height is enhanced by the rocky nature of its upper slopes. The highlight here is the Trilleachan Slabs: flat slabs of rock on which, if you remembered your binoculars, you can often see climbers finding the hard way up the mountain. And binoculars should be an essential companion on a journey up Loch Etive. 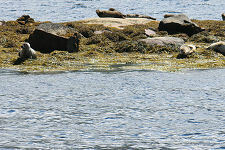 The seals that have hauled themselves out onto the rocks in the loch are easily visible. But it is often more difficult to spot the deer on the hillside, the golden eagles swooping over Beinn Trilleachan or the sea eagles now increasingly being seen here. 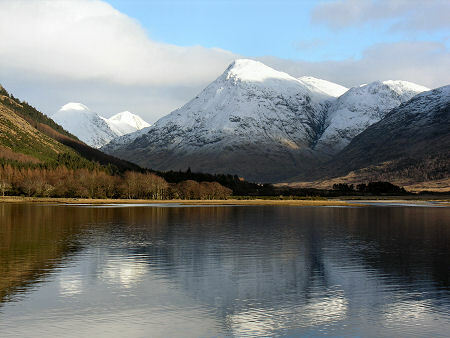 The north end of Loch Etive is dominated by the view up Glen Etive to the twin mountains of Buachaille Etive Mor and, to its west, Buachaille Etive Beag. 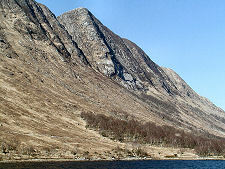 The north ends of these twin ridges dominate the upper parts of Glen Coe, but from the south they appear as twin cones.